Did either of you happen to think to take "before" photos? I didn't, I bought the paint after I first read this thread. After dinner tonight I decided to just do it (the couple Guinness I drank may have helped). I only did the driver side, so I could take a pic of the passenger seat that I'm doing next. I used to think the passenger seat looked pretty good until I got done with the drivers. Drivers had some color completely worn from wife sliding to get in and out of the car everyday and its completely hidden. It's worth mentioning that a couple of other sites I found online used these same color names, so I'm guessing that the underlying product is the same. These products are brushable paints, whereas it looks like the SEG product is in a spraycan. 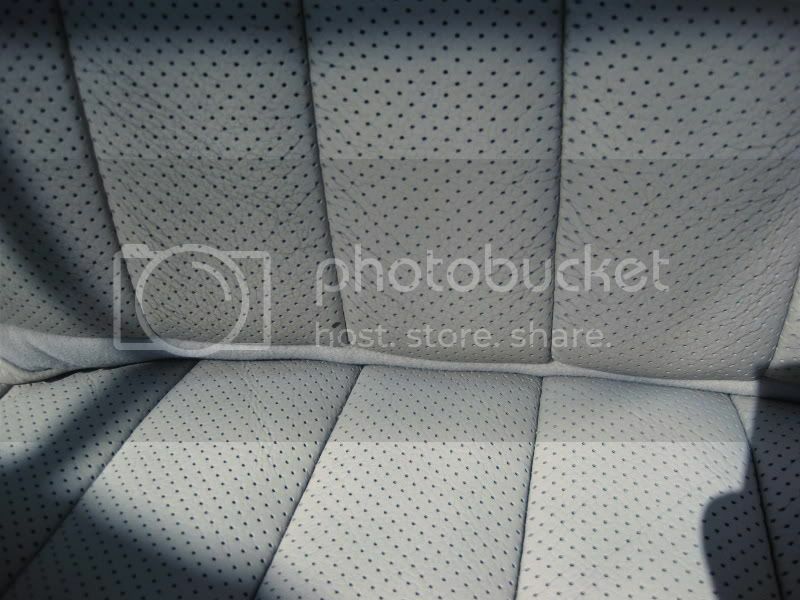 After looking at the before/after pictures, my one concern with an older car (like my '99 RX300 with tan leather seats in dirty/cracked condition) is that you probably couldn't get away with just fixing a single spot or one seat, without it standing out against the rest of the seat (or other seats in the car). I'm guessing that you'd probably have to commit to repainting all parts of all of the seats. If you were touching up a spot on an otherwise as-new looking seat, then perhaps you could get away with just doing that spot, but I'm still skeptical that their colors would match exactly enough. My other question/concern is that the original leather texture would be lost once you've applied a few coats of one of these products, resulting in a non-textured "flat" finish (or worse, "brush-stroke" finish). I think the repair kit would work better for touch ups, or tears. I think the spray works better for a complete smooth finish (I noticed in most of the pictures the brush marks). You may need to do 1-2 light coats on side or top pieces just to keep the color consistent on older leather. Frankly I figure I could mask an entire vehicle and spray in an afternoon. Even on really bad leather I don't think you would ever need more then a can per seat. This is the passenger seat that hasn't been dyed yet. Drivers seat was at least 2x as bad and had an area where the color was completely worn away. This is a comparison of the top and bottom of the driver seat, bottom finished. Notice the fine cracking and darker color of the top. The lighter color on the bottom is the original color (compared with the third row that is never used). 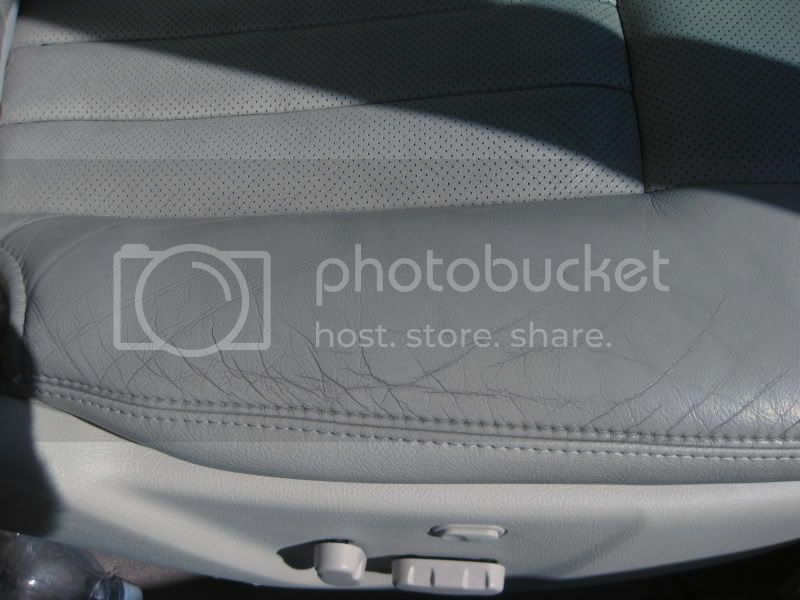 Would the SEM 15003 Phantom White work on leather? I am kind of scared because it said VINYL USE ONLY. Not leather. Dittos again Norman, this is sensational info for those of us with Ecru interiors, wonder if the saddle product would work just as well?? Anyone out there ever used it on saddle ? 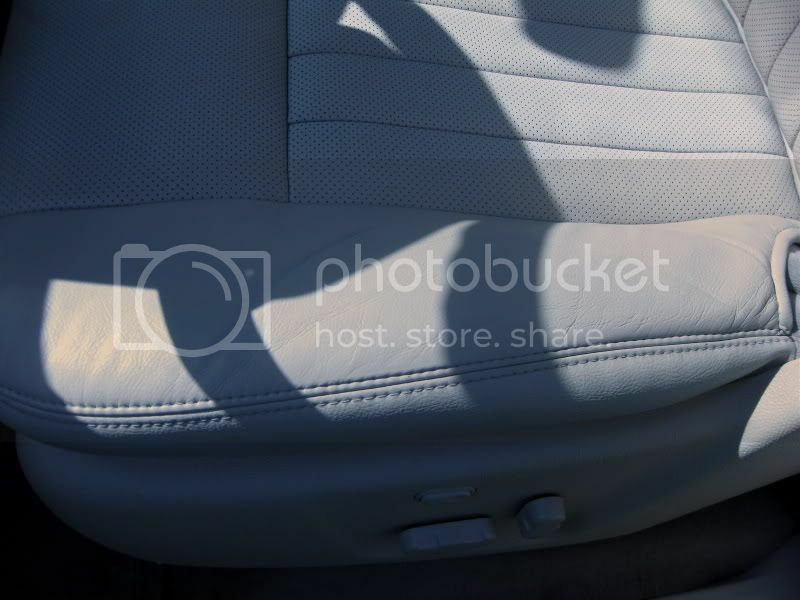 The guy that did my interior said that the worry about the Sem15003 Color Coat on Leather is that it isn't quite as flexible as Classic coat and if you spray it on leather trying to do a complete color change it will pull the old color out of the seat as it is acetone based and not water based. I am just quoting a guy that does it for a living so who am I to Argue? He used the Color coat on my Leather Seats and the color was a perfect match for Ecru. It filled the cracks in the leather but still left the leather texture. It hasn't rubbed off or shown any wear now in 1,000 miles. 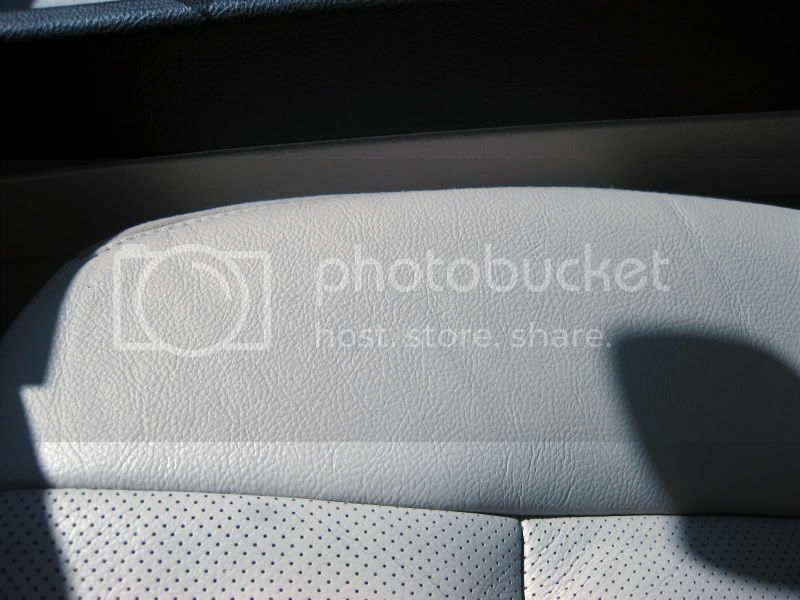 My wife thinks the seats are beautiful and she has no complaints so you know how important that is!!!!!! Thanks alot guys I am gonna go ahead and try this quick fix for my driver side door panel arm rest and give you guys feed back in a few days. I would anticipate you'll like the results. I had both of my seats done, the console and the left (driver's) armrest. Even though the grain in the leather can no longer be seen (it's more smooth than the actual leather, like you would expect from painting it), you don't notice it because the color matches so well. It's just not something the eye would ever compare unless there was a reason to do so. I've had numerous people look inside my car and comment on how clean (and new) it looks for a 2002. And that's exactly the purpose of doing it. Nothing's going to be like having the original leather back, but this is definitely the next best thing and a very fine alternative. That's why the Lexus dealerships do it. If it looked bad, or was poor quality, you know they would never seek these people out. They have their name to uphold. ok, just a quick question has anyone of you guys added water or condition the leather after this was done? I conditioned the leather about 36 hours after. Was recommended by a knowledgeable friend, the chemicals can dry out the leather a bit and conditioning brought the suppleness back. around $200 from the leather tech. I gave up trying to clean the belts and just replaced them. $181 each. I tried Oxyclean and all that stuff and they never got better than dingy white. They look great now though!